Featuring Damian on vocals and acoustic guitar and Adam on piano, vocals and acoustic guitar. 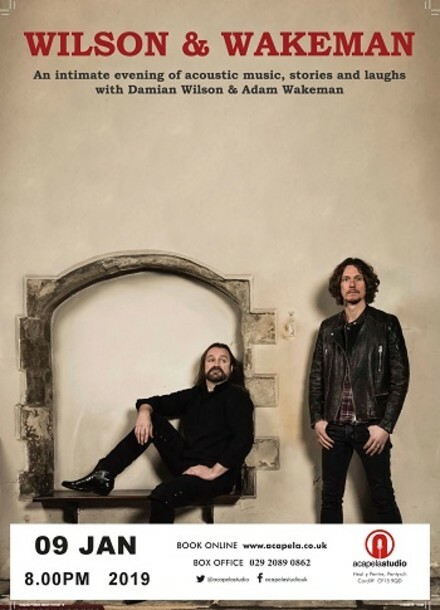 They'll play songs from their individual back catalogues and artists they have worked with, along with tracks from their joint albums, intertwined with stories and memories from their extensive touring careers in a show not to be missed. Damian is widely known in the rock genre, for bands and projects such as Headspace, Threshold, Ayreon and Rick Wakeman's English Rock Ensemble. As a solo artist he has released 5 solo albums, a DVD and a retrospective compilation album. He also played the lead role of Jean Valjean in Les Misérables on their UK National Tour. Their first joint acoustic album 'Weir Keeper's Tale' was released in 2016, but they've been working and playing together for a long time in bands such as Headspace and Rick Wakeman's English Rock Ensemble. Their latest album 'The Sun Will Dance In Its Twilight Hour' was released in February 2018.